Accessories are perfect for giving your presentation, exhibition or display a professional finish. Nimlok Online offers a wide range of accessories, supplies and products to add the finishing touch. 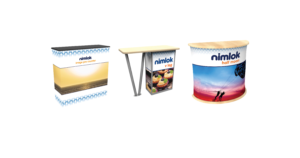 Counters, display lighting, literature racks, display kiosks, table throws, display cases, case-to-counter conversion kits and more are offered to help you easily add the flare and functionality needed for your event.